One day, I was on my way to do my laundry, when I discovered that I left the laundry detergent at home. Well, instead of doubling back home to get the laundry detergent, I went to CVS and purchased some more detergent. You might think that this is a waste of money, but I know how to get these things for fairly cheap. I usually keep a stack of clipped coupons with me in an envelope. I went through my coupons looking for some on laundry detergents and quickly found some. There were a couple of coupons in the stack for All laundry detergent that happened to be expiring very soon. I went through the CVS sales circular as well and noted that there was a “buy one get one free” sale on All laundry detergent this week (from Sunday, February 17, 2013 through Saturday, February 23, 2013). I picked out two bottles of All laundry detergent, used one manufacturer coupon from the newspaper insert, and 1 CVS Extrabucks reward during this shopping haul. Select bottles of All laundry detergent were priced at $7.99 that week. Please note that this sale is no longer in effect. 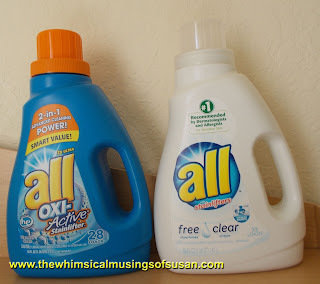 Therefore, I paid an average of $.74 for each bottle of All detergent (including the sales tax). I didn’t earn any Extrabucks rewards for the purchases this week. Aside from the fact that there was a strange dude hanging around the shopping plaza begging for money, I feel good about the shopping trip. I can’t stand it when people hang around shopping centers trying to hit people up for money, but that’s another blog post. Anyways, I saved a good amount of money and didn’t have to make a trip back home for laundry detergent.